An active individual knows that summer means beaches, bikinis and bronze skin. The summer offers a grade of liberty that we all seek. For some it means free campus gym, an extraordinary opportunity that we all seek but few use. Happily if you are really ambitious you can get beach ready at home with ease, you can get your body bikini ready with these 11 simple ab exercises right now just grab your iPod and workout outfit and start with the exercises below. 20 minutes three times a week is all you need to work out a great core. The repetitions will make win long term so be sure to complete the circuit happily. The sets are containing 32 repetitions. 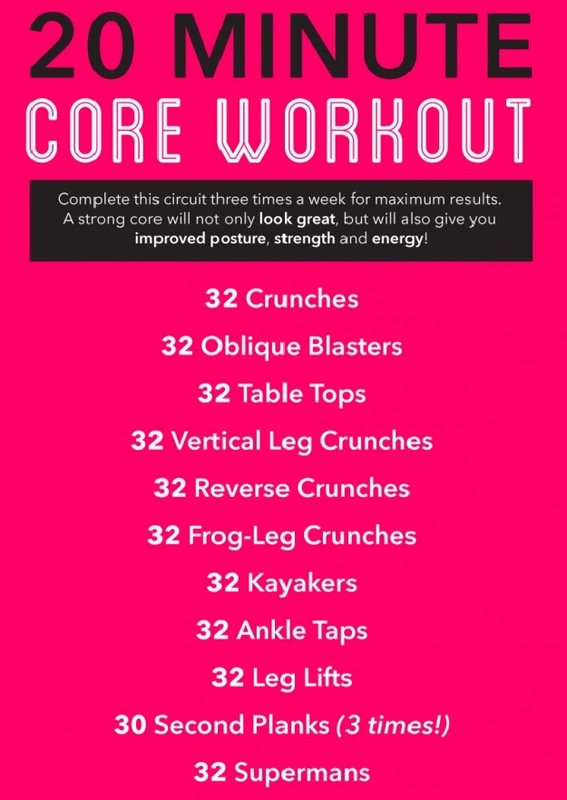 The workout begins with no less than 32 clasical crunches. Keep your legs in a 90-degree right angle and your arms behind your head with the fingers placed lightly on your head. Start crunching up and imagine that you are lifting your face toward the ceiling rather than pushing yourself to a seated position; in this manner your abs will take more strain than your neck and everything will become easier and yet more constructive. You are supposed to lift your entire upper body not your neck. Obliques are often overlooked despite being really important, these are the muscles along your side that are quite often blamed for the “muffin top”. By working your obliques you can transform your love handles into something more desirable. Start by crossing your leg over the left leg having your right ankle over the left knee. Twist your core toward the right leg and lift up 32 reps in the attempt to touch your left elbow to your knee. Avoid neck strain by imagining a tennis ball under your chin and using that imaginary distance for the entire crunch. You can actually use a towel if you fail to do so. If there is no burn along your side place your right arm out to further isolate your side muscles. After 32 repetitions change sides. Remain on your back now and simply raise your legs 90 degrees. Crunch up for 32 repetitions and remember to fully lower to the mat at each rep. It is important to focus on raising your face towards the ceiling instead of up and out. This exercise targets your upper abs. You already know what to do here. For 32 repetitions you will straighten your legs in sprint, as fast as you can. You can repeat afterward with the hands behind your head. Inner core muscles and upper abdominal will work in this exercise. With the reverse crunch you will not give your upper abs a rest by focusing on the belly pooch and on the lower abdominals. Position your hands under your bum with the legs straight up in the air and thrust your hips upward. Your behind will follow and be raised four to six inches off the ground. Set back onto your hand at each rep and do not use the momentum to get them done faster. You will only trick yourself. Return to the mat in a butterfly position, having your feet pressed together and the legs splayed out to the side close to the mat to make it more comfortable. Crunch up by using a tennis ball trick for no less than 32 repetitions. We will now sit. With the legs net at a 90 degree angle, slightly reclined. Keep in mind that the more you lean back the harder the move will be . It is time to begin the kayaking move by twisting our torso, tapping the ground at each side in rapid but highly precise movement. Repeat this step 32 times and follow with 32 more but with your feet off the ground. The hips and obliques will burn sculpting your body. Now with the legs bent at a 90 degree angle you will have to lay your feet flat on the floor. Start by swiveling your torso to the right and left, reaching your ankle with your hand each time before returning to the start position. Repeat on the left and make sure that in the end each side has received 32 taps. Control shapes this movement heavily. Make a T-shape on your back with your hands on each side or under the bum if you can`t handle the harder exercises. Legs flat, hovered above the mat. Raise your legs up, straight, till you have a 90 degree angle. Repeat this movement 16 times and make sure you never touch the floor. A stagnant move on your elbows and toes that creates a straight line by using the entire body. Deep abdominals will be targeted here. Do your best to keep this up for half a minute, rest 15 seconds between rounds. Always look down on your mat and not on the ceiling or wall in front . If you are unable to sustain it for 30 seconds lower your knees to the mat without dropping the straight line, this will lessen the intensity. Do not jump over this simple exercise. The inner core allows you to build muscle and that is what we are targeting here. You have to know that every front core muscle has a corresponding back muscle and you should work your back as much as your work core to avoid chronic back problems. Flip over on your stomach and let`s work your back a little. Stretch your arms and raise them off the ground, raise your legs five inches off the ground in the same movement, hold for five seconds and repeat. The arms will be straight throughout the exercise. Repeat 32 times here as well. Congratulations, you`ve done it ! Repeat this short workout three times a week and in two to four weeks you will see results, after six weeks you will be stunned by the progress. Never stop . The results will come. Improve posture will come as a great side effect along with more stamina, more strength and energy. 1 hour a week is all you need for all those. Improve, be better, be greater from today on !